IN THE TEACHINGS OF THE BUDDHA, the phenomenal world depends on mind: the material and the nonmaterial are all mind and therefore reflect our attitude or state of mind. In the phenomenal world, the experience of suffering does not come from dharmas or phenomena; they do not cling to us or make us confused. It is through expectation and doubt, attachment and aversion that our minds create samsara; it is not concepts or values, but the way we react to them. For example, we say that the situation in which we live makes our lives difficult, as if this difficulty were imposed by the world around us. We may say that New York is a difficult place to live with its tall buildings and many cars, but these are not what make it samsaric. We are simply looking for something to blame. If we think the problems are outside us and we have to get rid of them, we are stuck in samsara. This very clinging to an inside and an outside is what creates samsara . While meditating in a cave, Milarepa noticed a tiny crack in the rock. An apprehension that a demon would appear out of the crack frequently arose. He continued to cling to this idea and one day a rock demon appeared as Milarepa was singing one of his songs of realization. At that moment, the demon responded, "Your mind made me appear. I did not deliberately do this, but since your mind called me forth, here I am." This is an example of a state of mind or quality of perception creating samsara. Our habitual patterns of mind happen involuntarily and with such strength that we have no power over them. With these confused projections, we make problems for ourselves, it is our confused notion that the world around us creates confusion and suffering for us. In order to free ourselves of these habitual patterns, we must first tame our mind and develop mental stability. This is why meditation is so important. Meditation is "getting used to" or "building a good habit." As we are now, we experience defilements and negative patterns which did not arise all at once. From beginningless time we have been building, reinforcing and storing these habits in the alaya consciousness. They can be broken through, however, by getting used to positive habits in the practice of meditation. This will allow us to experience the nature of our mind, our Buddhanature, which has always been pure. The practice of shinay (shamatha) meditation will develop peace, stability, and one-pointedness of mind. Lhatong (vipasyana) meditation is the result of healthy shinay practice. The word lhatong means "seeing more," (more than we usually do). Instead of seeing things out of confusion we see what they really are. Through the experience of a more peaceful mind we have a more stable perspective. Let us take the example of a lamp. Its purpose is to give light, to let us see what we can't see in the darkness. If the lamp flickers constantly, it will be more difficult to see things clearly, this movement will not allow the flame to express its ability to give light. To be able to do this, the flame must be protected so that it can be still while the fullness of the light is expressed. Likewise, to experience true discriminating wisdom and the real nature of all phenomena, we need a calm and one-pointed mind. In this way shinay practice is the root of all meditation. We must not, however, neglect the practices of abandoning unwholesome patterns of body, speech, and mind and those practices which result in the accumulation of merit. Q: What is the mechanism in meditation through which we are able to change? Khenpo Karthar Rinpoche: The practice of meditation basically complements the inherent nature of your mind. The negative patterns that we talked about--aggression and anger--are not inherent characteristics of the mind. So when you practice meditation and begin to relate to the inherent state of the mind, these enlightened qualities can surface, and the intensity and frequency of the habitual patterns are subdued. Then you can discover such potential qualities as compassion and loving-kindness. Q: How can the mind be so easy to change and yet seem so difficult to change? Sometimes I think I've changed it, but then the habitual tendencies persistently come back. How do you get them to stay away? Khenpo Karthar Rinpoche: It is important to realize that the mind is not only capable of change, but that it easily changes. To begin with, you must free yourself from the detrimental belief that the mind cannot be changed and that these conflicting emotions are irreparable, permanent defects. You have been developing these habitual patterns over a long, long period of time, and of course they are going to be difficult to change. That is why Buddhist practice begins with an unwinding of the mind through meditation. In meditation, you practice a pattern of basic mental sanity again and again, with diligence. This works to counter the habitual patterns you have built up through constant repetition. While these patterns are not inherent or permanent, they are certainly not easy to do away with. Therefore, consistent meditation is essential. Q: What meditation technique do you practice and teach, basically? Khenpo Karthar Rinpoche: As far as the techniques are concerned, actually there is nothing so very unique or enticing, so to speak, about the technique. It is just simply tapping something that you have, tapping on your own resourcefulness towards the development of tranquility and stability of mind. Be it a technique that has more to do with benevolence and gentleness, or one that has to do with concentration, or whatever, it is a very personal thing. And although I personally am not a good example, I have tried for many years to examine what seem to be the faults and tricks of the mind, what seem to be the good qualities of the mind, and have worked on trying to develop the resourcefulness and good qualities of the mind and to cut down on or let go of the confused aspect of the mind. Q: I notice there are some differences in the way different teachers teach meditation. Is it that some methods come from the sutras and others from the tantras? What is the difference? Khenpo Karthar Rinpoche: To some extent, these different approaches may be because of the different styles of teachers or instructions. Whatever the style, though, the positions of the body play an important part in influencing our meditative development. It is not something that is just mentioned in the sutras and tantras--it is very strongly emphasized. There is a difference between the instructions in the sutras and tantras concerning these positions. According to the sutras, there are "five positions of Vairocana," and according to the tantras, there are seven positions, or more literally "seven Dharmas of Vairocana." These are the positions that contribute toward the state of Vairocana, which means seeing things in the most complete and clear way they can be seen. They contribute to the development of insight or panoramic awareness. In the five positions according to the sutras, placing the tongue on the palate and the thumb on the first or second joint of the ring finger, as well as the tightening of the sphincter and abdominal muscles (the "drawing up" motion), are not mentioned, whereas in the tantras they are. The five positions are complete in their own way; it is not as if they are incomplete because there are only five. To give an analogy, if you are going to build a two-story building, you could first get all the materials for the first floor and build it. When that is completed, you could buy the materials for the second story and start building again. On the other hand, you could build the first floor and, while you are building it buy the material for the second one. When you finish the first floor, you would be ready to build the second. 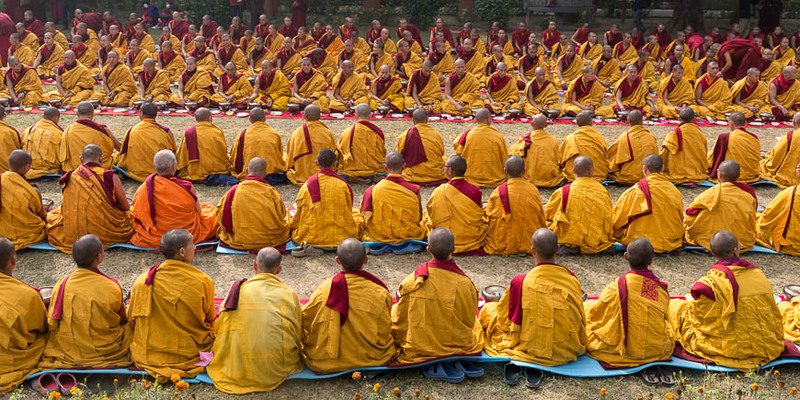 Right now what is being introduced is the practice of Tibetan Buddhism, which is unique in its integration of the three yanas. Not only is the hinayana shamata concept and understanding being taught, but also how to relate to the vajrayana point of view. The seven positions relate to the vajrayana practices, so they are introduced to build some affinity in an external way from the beginning. Probably the plan or strategy of those teachers who emphasize the five positions is that after a certain point the other positions will also be introduced. Q: Since I've started to meditate, I haven't had as much of a problem with upheavals of anger as I did before. But still, during practice, I sometimes feel anger arising so strongly that I have to get up from my practice because it's so uncomfortable. It's not that I vent it on anyone, but I don't know what to do about it. Khenpo Karthar Rinpoche: In that case one should investigate the source of one's anger. Is it caused by the practice itself, or are other factors involved? It may be caused by dissatisfaction and frustration with the order of one's mundane existence, and if that is true, then one should realize that disappointment is the nature of samsara. After all, that's why one practices the Dharma, in order to rid oneself of these hindrances. Now, if this feeling of anger is arising because of the practice itself, then one is not practicing correctly. Therefore, one should discuss one's practice and examine it to see where the problem is originating. Q: During meditation, certain thought patterns seem to keep coming up quite often, such as very strong angry thoughts. How can we work with these? Khenpo Karthar Rinpoche: There is some flexibility in the possible approaches we could take. There is what is known as "avoiding neurosis" and "accepting neurosis." The first case is the general or more basic recommendation, which means that when you meditate, you should make a commitment that this particular period of time is going to be spent purely in meditation. There should be a sense of total involvement. You should avoid getting hung up on recollections of the past or anticipations of the future. Instead, work in this situation with a stream of now-ness. Generally this is important, but sometimes you have to bend the rules to get certain things done. When certain thought patterns come up quite frequently, it can become like a battle of the ego or a battle of the thoughts. Then you start thinking, "This thought has been coming many times, and must not come again." If you have that kind of resistance against a thought, then it will come up again and again when you meditate, as if you actually invited it. When this particular thought comes, let it develop instead, as if you want to see its full shape. Basically, try to see how much is going to come and how far it will go. Simply watch it, invite it, and see how far it can come and how powerfully it can come. Interestingly, somehow it gets weaker and begins to fade out. This is accepting or taking on neurosis, which can sometimes be important. There is a true story about this. In Kham (eastern Tibet) there is a monastery. As is usual, there is also a shedra or school connected to the monastery, but somewhat separate. One part is where all the rituals and sadhanas and different kinds of practice are studied, and the other is entirely for the study of philosophy, metaphysics, and sciences. Anyway, there was an intelligent young monk in the school. The monastery was next to a mountain, and one time the monk had this thought that it would be very good if the mountain slid down and covered the monastery, but left the school alone. (He was not very pleased with the monastery for some reason.) After he had this thought, it came to him again and again many, many times. He felt this was really a bad thought, but it kept coming to him. Finally he approached the abbot and told him about this problem, explaining that the thought was happening all the time. The abbot said, "Oh, nothing is wrong. Let the mountain slide and the monastery get covered and buried under it. Let it bury whatever else is close to it. Let the mountain come toward you so you yourself and everyone around you gets buried. Let it bury as much as it wants to bury." The young monk did that, and the thought disappeared. What really got buried was the thought. We talk about the logical and rational point of view, but sometimes things have other ways of working themselves out. Sometimes this procedure could be a possible antidote. Frequently, those kinds of thoughts arise, and you deal with them in a different way. Generally, in a usual situation, if you had a very bad thought or attitude such that you would say, "This is very mistaken, and I should not have this kind of thought," and then you might encourage some other thought. That is, of course, one way of dealing with it, and it is important to be able to work with thoughts that way. At this point, however, you are working with meditation, and if you are in a meditative mood you would want to see the play of the thought and find what types of jumps and bounces it might take. The point is to see what the thought does, to see how far it goes and how it develops. When someone has meditated quite a lot and has some kind of discipline, although maybe not any great realization, this antidote is important. However, when someone is just starting out fresh, a beginner, this antidote is not so helpful and might not be one to apply. Perhaps there would be other antidotes to try. If you have some experience in meditation and have some idea of how things should be, when a strong sensation or a strong emotion arises, instead of trying to reject it or disregard it, simply watch it. In watching it, it mellows out or dissolves somewhat. Watch in the sense that you are watching a show, but not in the sense that you are encouraging the show. Whatever passes or does not pass, you just watch. Sometimes people have the idea that to watch means to hold the image or the thought, but the idea is just to watch. When you try to reject or disregard the thought, that seems to cause feedback. Sometimes when we are meditating, our knees or some other part of our bodies may hurt quite a lot, and as we normally do whenever we have a pain, we pay attention to it. We pay attention to it and definitely feel the pain. The more we pay attention, the more painful it becomes. That is what normally we do. In trying to take care of the pain, we pay a lot of attention to it, and it becomes more intense. Instead, when you are meditating and know that your feet or knees hurt, try to watch the pain in a mood of meditative awareness. This is different from paying attention to the pain. You watch the pain, and then you experiment. First, you pay attention to the pain, and then you watch the pain. When you watch the pain, you have the feeling that there is pain. If you do not feel it, it is not so great, but if you feel the pain, it is not anything you cannot take. It is there, but it is not very strong. Then shift away from that attitude and pay attention to the pain. Your knee is hurting; it is hurting a lot. In that situation, could you continue sitting? Probably not. If this situation applies to you, pay a lot of attention to the thoughts, to the emotions, to the sensations. They are very obvious and very intense, but you can simply watch them It is as though you are in some sense quite indifferent to this side or that side. You simply see the issue, and the issue is not very significant. It dissolves or mellows. This is an important point. As you enter into the practice of meditation, you should have a sense of commitment, but while you are in the process of meditating, whatever thoughts of the past or thoughts of the future arise, it is very important not to try to reject or suppress them. Instead, very gently go back to the breath, and if that does not work, simply watch. Q: In the shamata practice, sometimes I experience a very bright light, even though I continue to focus on the breath I know it is in my mind, because my eyes are closed and it is not the sun. I also have feelings of open space. Where do these things come from? Khenpo Karthar Rinpoche: It is good to know this is a mental experience, because if it were occurring outwardly, other people would also experience it. Interesting things can come up in shamata practice, because ordinarily your mind is so entertained by everything around you that you do not have time to figure out what is going on "behind the curtain." When you meditate and do away with the entertainment, these inner movements may arise. Yet these are merely mental and emotional patterns, and no matter how profound or how negative they might seem, simply return to the breath and continue with the meditation. If you see them as specific signs of your spiritual ability, or lack thereof, and try to discern their meaning, you will just be exercising your ego. That will hinder your practice. Basically, everything is fine. It is not that you are being rewarded or punished, so just keep meditating. That way, whatever situations arise will not give feedback to your ego. If you have a problem, do not judge whether it is good or bad. Simply notice it and come back to the breath. Since it arises from the mind, it will disappear from the mind as well. You can watch it gradually dissipate. All you have to do is bring awareness back to your breath. Q: I seem to have a habit of slowly moving my gaze upward as I meditate. Is this a problem? Khenpo Karthar Rinpoche: As a beginner, it is important to bring your eyes down to about an elbow's length in front of you. After having meditated for some period of time, if a person is able to maintain concentration and tranquility of mind quite smoothly and without interruption, it is fine to let the gaze rise. In fact, if the shamata practice is going very smoothly without distractions, then to further develop clarity, a person can keep their eyes open and look out with a straight gaze, without looking at any particular place. This is much more powerful. However, if you initially meditate while gazing straight, it is more difficult to bring about centeredness or concentration. At this beginning stage, both physically and mentally, we should be mainly involved with centering. Some sense of openness is important, but we cannot afford to be too outgoing. Then after a while, a person should not be content with just this small sense of environment or openness. Q: Is the great samadhi state you described earlier the same as bliss and tranquility from a hinayana point of view? Khenpo Karthar Rinpoche: In the stream of meditation and meditative realizations, this state can happen, and when it does happen, there is a sense of great tranquility and of rejuvenation. It is important when this happens, because it is an outer expression of the benefit of practice. There is one situation, however, that is strictly related to the hinayana methods. This occurs when a person gets so involved with tranquility and the blissfulness of tranquility that it becomes a state of absorption. At that point there is no clarity, there is no play. From the point of view of ultimate enlightenment, from the full Buddhist view of realization, to get absorbed in that way is a sidetrack. Q: How do we work with the glimpses we may get from time to time, glimpses of clarity or tranquility? Khenpo Karthar Rinpoche: In meditation practices, there are possibilities of gradually glimpsing or sensing clarity and tranquility without experiencing them fully. It is somewhat like an all-pervasive sense of joy or openness. This could take place after a certain amount of meditation, and it is very good. Clarity is important in the meditation practice. However, it is important not to cling to whatever arises by conceptualizing or solidifying it. At the same time, it is also important not to be suspicious and full of doubts about it. If the experience is very tranquil, almost blissful, there is the possibility of becoming sidetracked by thinking, "Oh yes, the meditation is really going very well, and probably nothing could go better than this. This must have to do with one of the better realizations." Yet this is not an actual or true experience, because it does not recur the next day or anytime soon. It is actually as if you were at the edge of some possible situation. It is very important that you not be obstructed by doubts, hesitations, or expectations. When you glimpse this kind of clarity, you should not think, "It is gone now, so probably something has gone wrong with my meditation. What could it be?" Or, "Something is really going perfect now. This must be it." Or, "I will see if I get more of this and get better at it." None of these expectations and hesitations are helpful, so simply go with it. Q: Is it possible that the negativity experienced can become more intense and more painful when you are coming to the possibility of a breakthrough? H.E. Jamgön Kongtrül Rinpoche: Before we enter this path, our negativity usually functions at a pretty even level. When we get involved in the path, we learn the means to get rid of negativity, we start to apply them, and they start to work. Sometimes our negativity breaks out and reasserts itself, and we have to reassert the antidote a little bit more powerfully. Later the negativity reasserts itself a little bit more powerfully, and it starts to polarize along those lines. This general pattern is to be expected. If a specific brand of negativity arises insistently in the course of one's practice, the proper way to deal with it is to talk with one's lama and ask his advice.